Dynamics 365 AI for Customer Service is a suite of products designed to help you provide better customer service experiences through the power of artificial intelligence (AI). 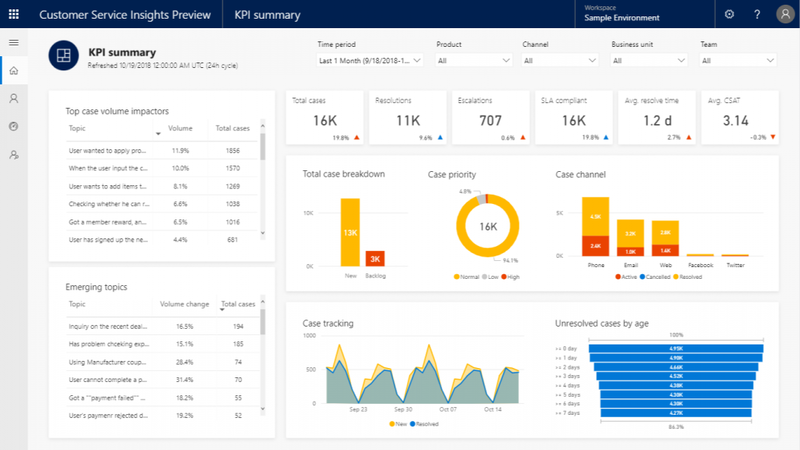 We are excited to announce Dynamics 365 AI for Customer Service Insights is now available in public preview, giving businesses access to artificial intelligence powered insights on their customer service data. Using our natural language understanding technology, we are able to automatically group cases by support topics, all without the need for any manual tagging of cases. Thanks to this clustering, new insights become available, such as automatic identification of quickly growing support topics before they have reached overwhelming volume. Thanks to the power of AI, your support team can efficiently identify opportunities for providing better customer experiences. Built-in dashboards, interactive charts, and visual filters provide views into support operations data across channels, and highlight areas for improvement that can have the greatest impact, helping you quickly evaluate and respond to key performance indicators (KPIs) and customer satisfaction levels. Out-of-the-box dashboards that provide visibility into critical operational and performance metrics for your customer service business. Automated grouping of your cases in topics based on natural language understanding of your case data. No need to manually tag thousands of cases into individual topics, AI does it automatically for you. Visibility into your top case volume and resolution time drivers allowing you to focus on areas with highest impact. Insights into emerging topics, allowing you to tackle issues before they become a major problem affecting your customers. Deeper understanding of your customer satisfaction scores, helping you improve customer loyalty and sentiment. We encourage you to try the free public preview of Dynamics 365 AI for Customer Service Insights to gain deeper insights into your customer service experience. The preview currently supports English and processes/stores data in the United States. You can read more about the detailed features we launched in the public preview, engage with us on the Dynamics 365 AI for Customer Service community and learn more details in our help documentation. This is only the beginning of how we can apply AI to help transform Customer Service. Dynamics 365 AI for Customer Service Virtual Agents will be available in preview early next year and provide businesses the ability to digitally transform their support experience and reduce human agent workload by creating virtual agents to handle common support cases. A simple, no-code user interface will empower your customer service teams to easily create and maintain virtual agents. The virtual agents will be tightly integrated with customer service insights to enable the customer service team to be data-driven when identifying which cases to automate and easily monitor and refine the virtual agent interactions. Let us know your feedback on the public preview, we are looking forward to your input!